Straight from the screen of just about every sci-fi movie ever, the Rufus Cuff is a revolution in smart watch design that’s less watch and much more smart. The device’s 3 inch screen offers a whole host of features both on its own and when paired with a smartphone from face to face video calls to calorie tracking. 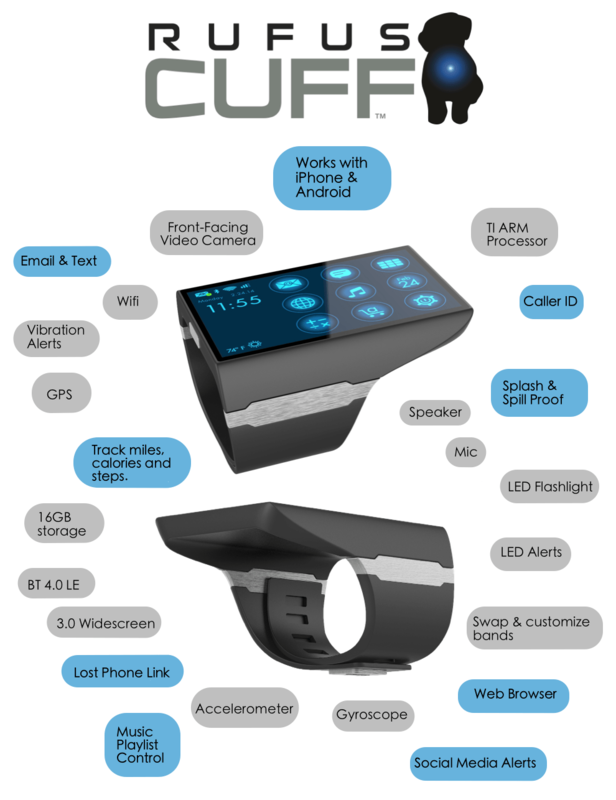 Unlike other wearable devices that run Android Wear (a watered down version of Android) the Cuff uses the full Android OS, giving it nearly all the same abilities as a phone or tablet. When synced to your phone (which is little more than a sim card holder compared to the Rufus) the cuff can make and receive calls through its built in mic and speaker; just hold your wrist up to your ear. You can also make use of the front facing camera for video calls or Skype. Texts and email can be answered with a full screen keyboard, or dictated via Siri or Google Now. If you should miss a message the cuff will politely get your attention through vibrating alerts and LEDs. Between the built in GPS, accelerometer, gyroscope and water resistance, the Rufus Cuff makes an ideal fitness companion when integrated with apps like RunTracker or Endomondo. If you’d like a part in bringing the potential future of wrist-wear one step closer, the Rufus Cuff can be ordered from its IndieGogo page starting at $279.